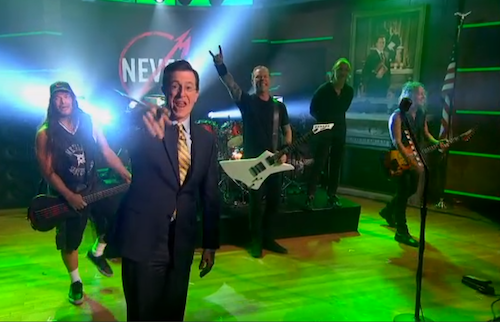 Metallica were on The Colbert Report this week, promoting their new 3-D concert movie Through the Never. Stephen seemed genuinely delighted to have a metal band to (*cough*) riff off of, and for their part Metallica were game straight men, allowing their host to score some laughs and even scoring some of their own. • The match up between motormouths Lars Ulrich and Stephen Colbert was no contest. Stephen is just too fast with his quips and Lars could barely get a word in edgewise. • Stephen tells the band that he loves Saint Anger ("Never actually heard the album"), and they smile politely, perhaps knowing that it's the lowest point in their 30 year discography. • Stephen suggests "Next to the Always" and "Under the Sometimes" as alternate titles to the somewhat nonsensical Through the Never. • The band's performance of "For Whom the Bell Tolls" was introduced by Colbert's previous guest, Jesuit pastor Jim Martin. 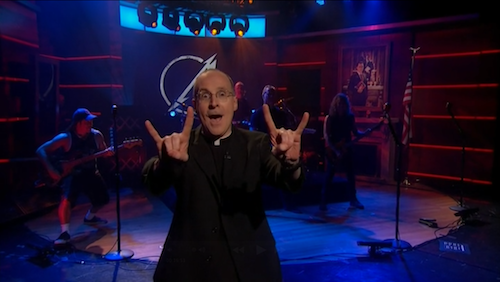 Multiple levels of irony to unfold: a priest introducing the world's biggest metal band; the same priest gleefully flashing devil horns; the author of an article chiding the entertainment industry for its "obvious contempt for the Catholic Church" roped in to introduce the band that wrote "Leper Messiah" and "The God that Failed"; and the fact that the pastor shares a name with Hetfield's old buddy, Faith No More guitarist Jim Martin. • Metallica running around and vamping on Colbert's tiny (compared to what they're used to) studio stage like it was their normal arena set up was pretty endearing. • Massive reverb on Hetfield's vocals throughout the night, but the performance was still fairly raw and unrestrained. Going to go out on a limb and guess that Metallica aren't playing to a backing track yet. • Even though I saw Metallica play "Master of Puppets" live and in person, it was somehow even more thrilling to see them play it on The Report, with Hetfield substituting at least one "master" with "Colbert!" Also, Stephen's introduction was beyond amazing.